complete overhaul of the machine acquired from C&P Soilcare. Nicknamed ‘Phoenix’ Terrain’s Deep Drill will be on display and involved in frequent demonstrations over the three day show. Last seen at Saltex in 1999, the Deep Drill performs surface aeration, penetrating 10 inches below the surface with a drill head holding 60 tungsten tipped drills at 5inch spacings. 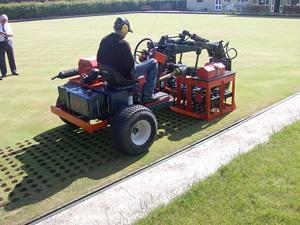 With a ground pressure of just 9 psi the machine is ideal for promoting healthy root growth, improving surface drainage and increasing the uptake of nutrients on winter sports fields, parks, racecourses, bowling and golf greens, tees and fairways. Play can resume immediately after treatment. The Airforce Terralift Fleet will also be on display and demonstrating compressed air de-compaction treatment to a depth of one metre. On Wednesday 9th Sept. the second day of the show Derek Patch of the Arboricultural Advisory Service will be on the stand to answer questions on tree care and maintenance.